If you live Japan! Rent a soundproof room from Yamaha! 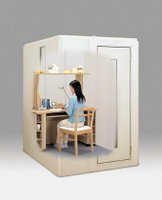 In Japan you can rent a soundproof room from Yamaha it is a room within a room. If the text below looks a little funny, well it has been translated from Japanese. Rental period from 12 months to 36 months. After taking an examination end also return is possible, pays and is completed appropriating rental charge, also halfway purchase is possible."